The revolution will be bookmarked. Which is about as far as I’ve been getting lately. Lots of bookmarks, printouts, etc., while I bide my time to still my thoughts, focus, and write. It’s been busy busy at school since I got back from Germany, but I am working on a post about my short trip to Hamburg and the St. Pauli football game the night I arrived (and the related stickers!). The post is called “Hamburg ist braun weiss” meaning “Hamburg is brown/white,” which is the color of the team’s home jerseys and the text on one of the stickers I picked up. Other topics from the trip include the October 15 protest in Berlin while I was there and a few anecdotes about various people’s responses to urban re-development in Berlin and Hamburg. My set of Berlin photos on Flickr can be found here and a set from Hamburg here. 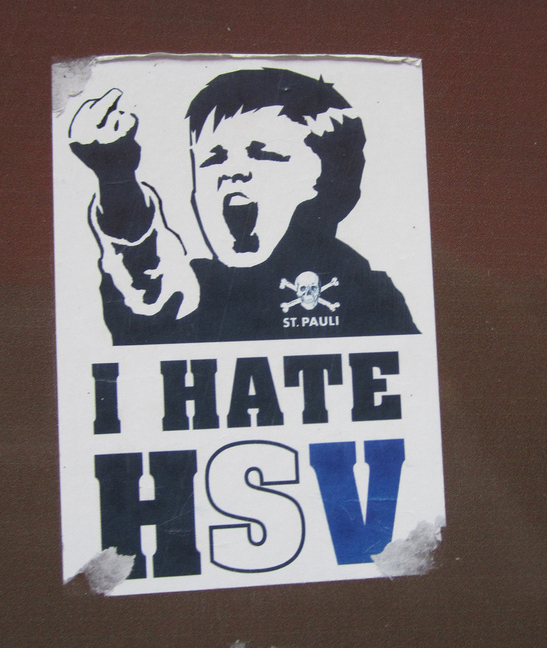 Below is a Hamburg sticker making fun of the Hamburger Sport-Verein sport club (note the port city trademark pirate/skull and crossbones imagery). Those St. Pauli fans take the sport very seriously, but more on that to follow.